Does your GameBoy Pokemon no longer keep you game save? WE CAN FIX IT! Did you play Donkey Kong Country on your Super Nintendo yesterday for 6 hours only to turn the game back on and have to start from the begenning? WE CAN FIX IT! Chances are the internal game save battery in your video game cartridge is no loner functioning. Orignally these batteries were through of as life time batteries! Expected to retain their game saves for more than a 10 years is tehnically an amazing. However some of these games are now 30 years old and are often in need of a little TLC. The good news is here at videogamesnewyork we have the expirence and ability to solve the issue for you. All of our games get a new gamesave battery installed as apart of our daily process to prepare games for sale. We also refurbish the pin connectors and clean our any loose plastic or debris ratalling around inside the plastic cartridge. 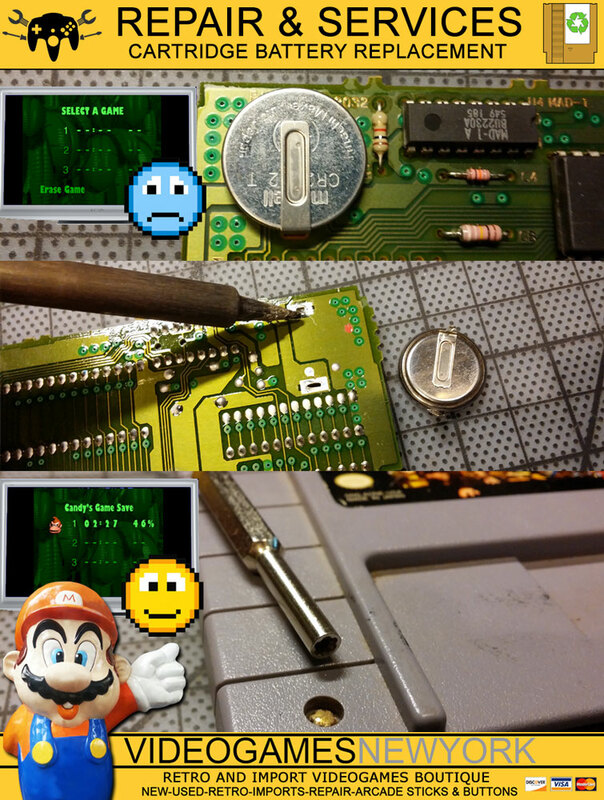 This repair can fix games like: Pokemon Red, Pokemon Blue, Pokemon Yellow, Pokemon Silver, Pokemon Gold, Pokemon Green, Pokemon Crystal, Super Mario Land, Wario Land, Final Fantasy Legends 1 & 2, Legend of Zelda, Super Metroid, Super Mario Woald, Super Mario Kart, Super Mario All-Stars, Donkey Kong Country 1, 2 & 3, Super Mario RPG, Crono Trigger, Earthbound, Final Fantasy 2, Final Fantasy 2, Secret of Mana and 100's of other video game cartridges! Your games can also recive the same treatment!